I had so many questions while deciding whether or not to get our first mini pig. I owned dogs but didn’t know anything about owning a pig. I have learned so much from my experience finding and raising Oscar. My hope is that my experiences help you decide if a mini pig is right for you and, if so, help you get off to a smooth start! Below are the main questions I get asked about mini pigs. There are four main sections so that you can find the answers you need: Basic Mini Pig FAQs, I’m Considering Getting a Mini Pig FAQs, and I Just Got My First Mini Pig FAQs, and I Have More Questions About Mini Pigs FAQs. How big do mini pigs get? You can drive yourself crazy researching this question, as I did when deciding to get Oscar. Some people will tell you all about their teacup, micro, or mini pig, and others will tell you that none of those even exist. A few breeders will give you a weight guarantee, others will give height guarantees instead, and some won’t give guarantees at all. From what I understand, it’s even possible for a pig to get a grandparent’s gene and end up unexpectedly larger than both parents, surprising you and the breeder. I had all of these concerns when deciding on Oscar, and here’s my take on it. There really are no guarantees on pig sizes, so hope for the best and plan for and expect the worst. I knew I was ready to get Oscar when I was okay with him being 200+ pounds. If he grows to be 60 pounds, that’s great. If he grows to be 200 pounds, I will love him the same and have the space and ability to house him if he does get that big. If you know you can’t keep a pig over a certain weight (like 25 or 50 pounds), a mini pig is not the best option for you at this point. You don’t want to bond with your new piglet and then have to give him or her away. Make sure you’re okay with a large pig if yours gets big, and you can focus on loving your new baby and not stressing about a quickly growing pig. I’m keeping track of Oscar’s height and weight as he grows, so feel free to follow and see how big he gets. How long do mini pigs live? Assuming that a mini pig is healthy and properly cared for, the average lifespan is 12-15 years. Are there veterinarians for mini pigs? Yes, and it’s very important to find a mini pig veterinarian near you before deciding to get a mini pig. I recommend doing an internet search of vets near you and also calling to confirm that your selected vet will provide care for your mini pig. This article is a good place to start when looking for veterinarian care for your mini pig. What do mini pigs eat and how much? Mini pigs can eat so many things! Finding a variety of things to feed Oscar is fun. For his meals, we feed him Mazuri Mini Pig food. They have several kinds depending on your mini pig’s age, so make sure you get the right kind for your pig. Since Oscar is still young and small, we feed him 1/4 cup of the pellets twice daily (based on our vet’s recommendation) and supplement it with vegetables, salads, and occasionally fruit. Consult your veterinarian about the best type of food and amount for your mini pig. Mini pigs can eat a lot of the same foods humans do; just be sure to avoid salt and too much sugar. You want to feed him or her a variety of foods in moderation, and it’s extremely important to not overfeed or underfeed your pet pig. Here is a list of Oscar’s favorite treats! Can mini pigs be potty trained? Yes! Oscar was much easier to potty train than our dogs! Also, pigs can be trained to go outdoors, to use a litter box, or both. Pigs are smart and generally potty train easily but, as with any young animal, there will be accidents so training requires patience and consistency. Young piglets cannot completely hold their bladders until they are older (I’ve heard nine months old), so it’s important to make sure they have easy access to a potty box or outside every few hours. Can mini pigs be trained to do tricks? Yes! Pigs are smart animals, so I recommend training your pig for basic obedience and any other tricks you like. Have fun with it! I use clicker training because it makes the most sense to me, but there are so many great training methods. Here is a video on basic mini pig training and how I taught Oscar to go in a circle. He has also learned to sit! Yes, they definitely can! Oscar went through a brief biting phase that we were able to stop, but mini pigs can bite hard if they want. If your mini pig is biting, make sure to take it seriously and stop the behavior as it will become a real problem as your pig grows. Here is more about Oscar’s biting phase and how we got him to stop. Update: After Oscar’s first biting phase, we stopped the behavior and went several months without any biting issues. Then, he started biting again. Here’s what we did the second time to try to stop his biting. Do mini pigs make noise? What do mini pigs sound like? Mini pigs make several different noises. Oscar made some sound recordings so you can hear his different noises! Hear him oink and also make his anticipatory, frustrated, and hangry sounds. He was even kind enough to record his squeal! You can also listen to Oscar’s sleepy screaming or snoring sounds. Are pigs different than dogs as pets? Yes! We have experienced some definite differences between mini pig and dog personalities. The main difference for us is that our mini pig doesn’t have the desire or need to please us like our dogs do. Pigs are stubborn and, frankly, Oscar mainly does what he wants. He balances this out with being smart and funny. He also trains more easily than our dogs. Another main difference is that our mini pig isn’t as playful as our dogs. He is more cuddly than our dogs, which I absolutely love about him, but he doesn’t have much desire to play with toys. He would rather eat! Should I get a pet mini pig? First things first: check your zoning laws and find a local veterinarian who treats mini pigs. Before you get attached to the idea of getting a mini pig, make sure owning one is legal where you live and that you have a vet who is qualified and willing to provide care for a mini pig in case of an emergency. Mini pigs are amazing pets for the right people and the right homes. They take a lot of work and provide a ton of love in return. Mini pigs are stubborn and require a lot of attention. They do not like to be left alone for long periods of time and can become destructive if they get bored or lonely. They are smart, which is a great quality but also brings with it more challenges than a less intelligent animal. If you have the time and energy to spend on raising a pig, they will be an amazing pet for you. If you aren’t sure if a mini pig is the right pet for you, I also recommend spending time in groups or forums for pig parents to see what issues and concerns they are experiencing. There are two main Facebook groups I recommend: “Mini Pig Education” and “Pre Loved Pigs.” Join these groups and watch the posts for a while. This is a great way to see the good and the challenging of owning a mini pig and to find out if a mini pig is the right pet for you. Is a mini pig right for my family? When deciding if you want a mini pig, make sure to discuss your decision with your entire family. Since pigs require a lot of love, attention, and discipline, it is important that each member of your family is on board with your decision. I really can’t stress this enough. My husband and I waited several years before we were both excited about getting a mini pig, and I’m so glad we did. There were times when one of us was too busy or too overwhelmed to be completely on board, and raising a pig is so much easier (and more fun!) when each family member pitches in to help. Is a mini pig right for my home? Before you get a mini pig, think about the type of home environment you prefer. This is an area we didn’t consider enough initially. We enjoy a quiet home, and Oscar is much louder than we expected. In fact, Oscar makes noise most of the day. Aside from the initial squealing, Oscar “talks” to us pretty much all day through oinks and grunts. Some of the noises are adorable, but some are very loud and disruptive. Pigs also get three sets of teeth in their lives, so teeth grinding is very common. Overall, we have accepted the noises, but it’s something to consider before making your decision. If, for example, you run a business out of your home and need quiet for phone calls or concentration, make sure you have a place where you can get away from the pig noises if necessary. 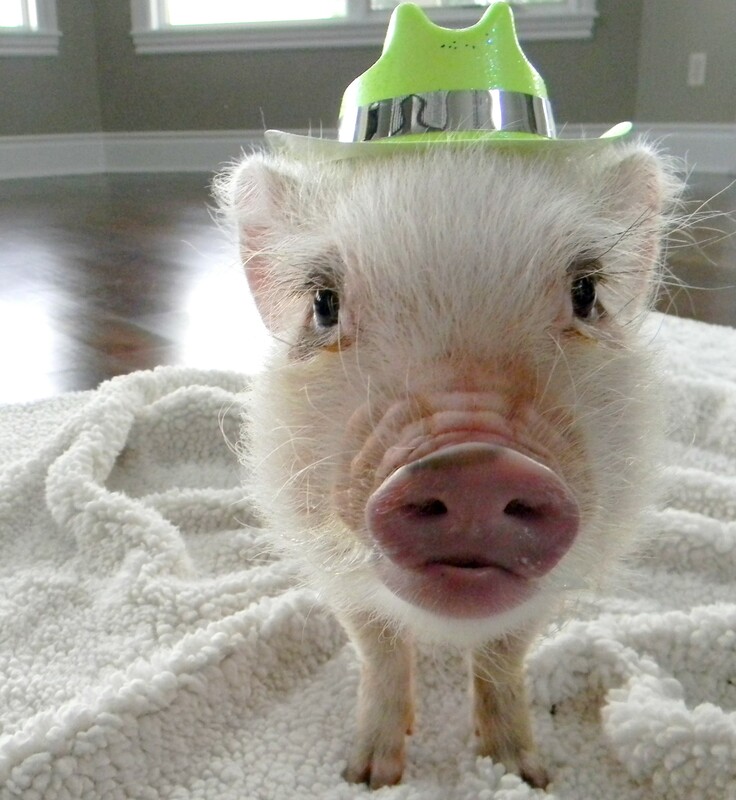 For actual sound recordings from Oscar, check out our post on mini pig noises. 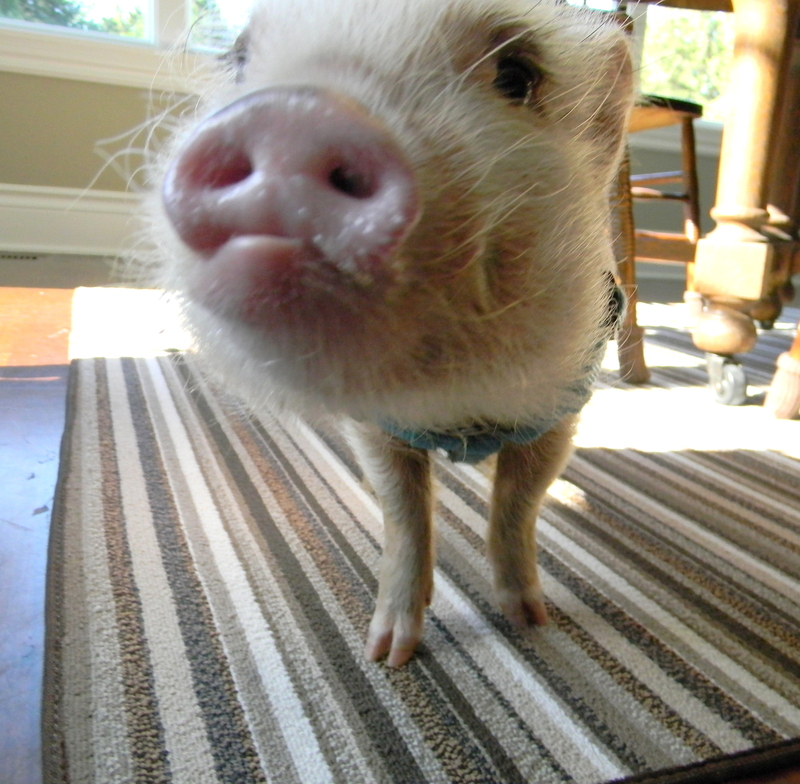 What are the pros and cons of owning a pet mini pig? For my lists of mini pig pros and cons, check out my post on mini pig pros for the best parts of owning a mini pig and on mini pig cons for the tougher parts. How do I pick a mini pig breeder? There are tons of teacup, micro, and mini pig breeders out there, and it’s difficult to pick the “right” one. Make sure you’re comfortable asking the breeder questions and don’t hesitate to ask as many as you need to feel confident you’ve selected a good breeder. Here are some important questions to ask a breeder to help narrow down your search. One question to ask a breeder is how old the pig’s parents are. Pigs can breed at a really young age but don’t grow to their full size until around three years old, so it’s possible for a breeder to show parents who are under three years old in pictures and not yet full grown. The breeder may be showing you the real parents, but the parents may still have years to grow before reaching their full size. Although there are no real size guarantees with mini pigs, make sure you ask the breeder the parent pigs’ ages if you’re trying to estimate size. Another question to ask is how old the piglet will be when coming home to you. There are different opinions on the right age, but you want to make sure the piglet is old enough to be weened from his or her mother before being available to you (many people consider 8 weeks the minimum age). I didn’t ask this question of our breeder, and Oscar was five weeks old when we picked him up. Everything turned out okay, but I was concerned for a while that he was weened too soon. Make sure to ask a breeder the birth date of your piglet and at what age they make piglets available to get a feel for if the breeder is right for you. If you are able to consider location in your breeder search, I recommend doing so. Many mini pig breeders will ship piglets, but I wanted to avoid that if possible. I was lucky enough to find a breeder within a few hours of us, so we drove to meet the breeder and pick up Oscar instead of putting him on a plane. If a plane is your only option, that’s okay too but consider closer options if you have them. Once you’ve done your research, just pick the breeder you feel most comfortable with. I researched tons of breeders and found positive and negative feedback with most. After asking all of my questions, I picked the one that made the most sense to me knowing it might not be the “best” or the “right” one. Do your research, gather your facts, and then go with the one that feels right to you. Is it possible to get a “rescued” mini pig? Yes! There are many teacup, micro, and mini pigs who need homes for so many reasons. For many of these pigs, their owner didn’t plan for how large the pig would get and other owners didn’t truly have the time or energy required to raise a pig. If you are able to take in a rescue pig, there are rescue sites that will help connect you with great pigs who need homes. One site you can check out is Pig Placement Network, but there are also groups on Facebook for pigs needing to be rehomed, including “Pre Loved Pigs.” Don’t forget to check your area’s Craigslist as well but, as with any pig, make sure you are okay with any size of grown pig before you adopt. I have dogs. 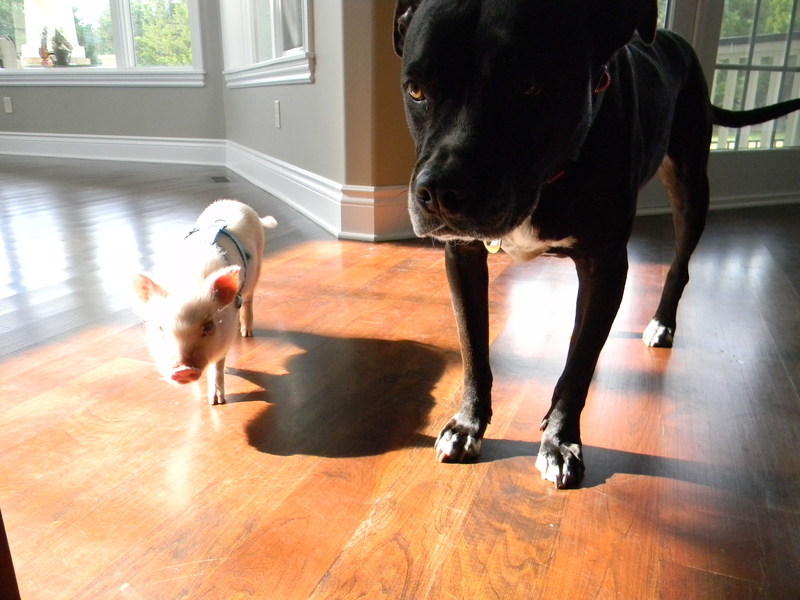 Will my mini pig and my dogs get along? This is tough to answer because every situation is going to be different. We have two dogs, a pit bull mix and a Boston Terrier, and they are friendly but generally not welcoming of new animals, so this was one of our biggest concerns when deciding if a mini pig was right for our home. Our dogs and Oscar are doing fine together, but the dogs tolerate him more than love him. We also never leave the dogs and Oscar together alone. If we can’t be in the room with them, I make sure they are in separate rooms or each in their own crate so that everyone feels comfortable and safe. Pigs and dogs can be great friends or have disastrous outcomes, so make sure to always keep an eye on them or separate them if you’re not around. For more on how we introduced Oscar to our dogs and how they’re getting along, check out this post. What should I buy to prepare for my mini pig’s arrival? This is such an exciting time, and it’s fun to get everything ready for your new pet pig! Before your mini pig arrives, I recommend getting a crate, a bed, blankets, food and water bowls, litter box and puppy pads, a harness, and a play pen. I have a detailed post on what we bought Oscar before his arrival and what ultimately worked (and didn’t work) for us. Will I be able to hold my new mini pig? Unlike dogs, pigs generally do not like to be held as it’s just not natural for their feet to be off of the floor. This doesn’t mean that you can’t eventually pick up your mini pig, but it will take some time before you can hold your pig without him or her squealing. A quick tip on this: if your mini pig squeals while being held, do not put him down. It’s important to hold your pig through the squealing so that he doesn’t equate squealing with getting what he wants. Here is a video on how to hold your mini pig, so if you’re preparing for a new mini pig or having trouble finding the best way to hold yours, check it out. I just brought home my new mini pig. What do I do now? Mini pigs take time to trust and bond with their owners, so go slow and let your mini pig get to know you. Mini pigs don’t like to be held initially, so avoid lifting and holding your mini pig right away if possible. Find a small room to confine your new piggy to so that she feels safe (and to avoid accidents), but make it a space where your piggy can still see you. We didn’t have a room that worked for this, so we bought a portable play pen; this kept Oscar confined to a small, safe area but made it so we could move him from room to room with us. Spend time just sitting on the floor and letting your new piggy come to you. Feel free to use treats during the first few weeks to help your new mini pig feel safe and comfortable being near you (place the back of your hand flat on the floor and place the treat in the palm of your hand as this gets your piggy used to taking treats gently). If you’ve raised a puppy, the bonding process for a puppy and a piglet is very different, so don’t worry if your pig isn’t immediately warming to you. Keep letting your piggy come to you and get to know you; the bond with your mini pig will take time but will be so worth it! My mini pig hates his harness. How do I put a harness on my mini pig? Putting a harness on your mini pig can be challenging in the beginning. Here are a few things to try. For the first few times, try putting the harness on your mini pig when she is sleeping or resting on your lap. 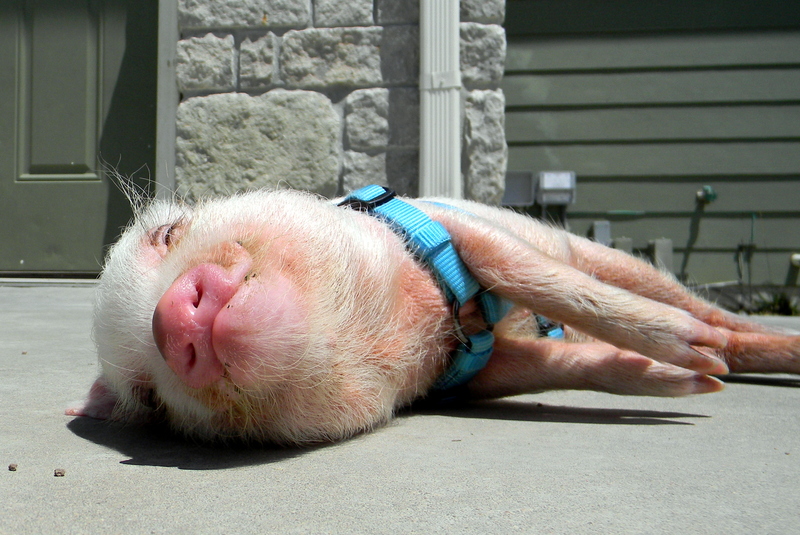 Your mini pig will be relaxed and less likely to fight the harness. Another thing I recommend is giving treats when putting the harness on your mini pig. The positive reinforcement helped Oscar to see his harness as a good thing, and it instantly made harness training easier. This post discusses types of harnesses for your mini pig and includes a video (featuring Oscar!) showing how to put a harness on your mini pig. My mini pig is foaming at the mouth! What’s wrong? Nothing – don’t panic! It’s natural for mini pigs to foam at the mouth. Your pig is probably wanting to eat or even just thinking about food. My mini pig roots outside and comes in with a muddy snout. I try to wipe his snout clean, but he throws a fit. What can I do? Instead of wiping down your mini pig’s snout, try tricking him into cleaning it himself. When your mini pig comes inside, take him to his water bowl to get a drink. If he’s been eating grass, he will likely want a drink anyway. When your pig gets a drink, he will naturally clean his snout off in the bowl. This has worked for us every time. If your pig has a really dirty snout and that doesn’t work, try grabbing some treats to give while you wipe down his snout and see if that makes the process easier. My mini pig seems itchy and is scratching a lot. Is this normal? Mini pigs love to scratch, and it’s normal for pigs to scratch on furniture, against walls, and anywhere else that suits them. However, if your mini pig is scratching obsessively and is having trouble focusing on anything but scratching, you might be dealing with sarcoptic mange. Oscar had sarcoptic mange after coming home for the first time, so you can read about his mange symptoms and treatments to learn more. How can I entertain my mini pig? A lot of mini pigs aren’t very playful, so you might need to get creative with ways to entertain them. We bought Oscar tons of dog and infant toys, and he really wasn’t interested. Pigs mainly play with toys that involve food, so most types of food-oriented toys will work as long as you watch your pig’s overall treat intake. After a lot of trial and error, here is a list of Oscar’s favorite toys that might help you find some for your mini pig. Where can I find clothes for my mini pig? Finding mini pig clothes is surprisingly challenging! I went on a quest to find clothes for Oscar and tried dog clothes and even infant clothes, but those didn’t fit him. I ended up sewing some clothes for him and also finding a great online store. Check out my updated mini pig clothes post for more details. It’s not working out with my mini pig, and I need to rehome him or her. How can I do that? There are times when it’s necessary to make the often difficult decision to rehome your pet mini pig. If you are in that situation, there are some sites that can help. I recommend joining the group “Pre Loved Pigs” on Facebook, and you can post your pig for rehoming there. There are many pigs lovers in that group who can help find a good home for your pig. Another option is to check out the Pig Placement Network to learn more about how you can surrender and post your pig on their website. My question wasn’t answered on here. Where can I get more information about mini pigs or an answer to a specific question I have? I am currently not able to respond to comments on the site, but there are other ways to get answers to your questions about mini pigs. One option is to do a search on this site to see if your question is answered in a previous post or comment. Another option is to join and post in the group “Mini Pig Education” on Facebook. That group is full of experienced pig owners, so you can often get quick, helpful responses to questions, whether you are a potential or current mini pig owner. Hi Suzanne, congrats on getting Harley! I haven’t experienced that with Oscar, but I’m wondering if it’s a dominance issue. As you might already know, pigs love to be the top of the hierarchy and will often challenge dogs and other animals in the home to work their way up through the “ranks.” Have you noticed any other signs of Harley trying to gain dominance over the dogs? It’s just my guess, but that’s the first thing I would explore. It’s also possible that the dog still has some of Harley’s scent on her each time, so try to get Harley’s scent off as much as possible so that he isn’t encouraged to continue peeing on her. Mini pigs will often continue peeing in one spot, particularly if there is any scent left over. Of course, I recommend talking to a vet experienced with mini pigs to see if they have dealt with the same issue in previous patients. Good luck! Please keep me updated! I just got my little mini pig two days ago and she’s about 6 weeks old. Just today and last night, she’s been biting… Not so much biting but snapping. I read what you had but I’m a little confused on if she’s sittin in my lap and I’m petting her anywhere near her mouth and she bites me. I have a rag over my hand but I wanted to give her positive reinforcement and give it to her before she bit but then am I not rewarding for anything and just spoiling her? I know I have to be the boss and all. Help me please! Hi Alesia. Thanks for sending your question! Congrats on getting your mini pig. It’s such an exciting (and kind of stressful!) time when you first bring them home. I think it’s great that you are taking action to be the boss and to stop the biting so early. My advice might sound a little counter intuitive and is only based on the fact that you just got her two days ago. For the first few weeks, I wouldn’t worry about spoiling her and would just make sure she’s comfortable at home. Go ahead and give her some extra treats and see if the biting stops once she’s settled in. I think it’s extremely important to be the boss with mini pigs, but go ahead and cut yourself a little slack on that for now. Oscar was so scared and out of his element when he first came home, so a lot of the behaviors he exhibited were out of fear and not really himself. Don’t get me wrong, if she’s still biting like that once she’s completely settled in, it’s important to stop it and I recommend a more serious approach. NAPPA has a great article called “Who’s the Boss” that I recommend if the biting doesn’t stop once she’s comfortable at home (http://petpigs.com/resources/pig-training/whos-the-boss-i). Give her a few weeks and go ahead and spoil her for now, and see if she’s still biting once she feels safe around you. Biting is a serious issue and should be stopped, but it might be out of fear right now instead of a real behavior issue. Keep me updated if you can! I would love to know how she’s doing! When we first got our mini pig he snapped at my husband and hasn’t done it since. I think he was scared as he just left everything he knew and his mum. He has never snapped again and is now 6 mths old. Be kind and patient. I have a 13 week old mini pig Ruby who I have obviously spoiled. She gets along great with my Boxer/Husky mix and my English Mastiff. My 3 cats tolerate her and that is about all.. I am so obsessed with minis that I just got another mini and Marley is 6 weeks old. Ruby has found no humor in having him in the household. She is biting him and me, she wants held all the time which she never did before and Marley is not fighting back and still tries to follow her around. Any advice on how to blend my household? Hi Pamela. Thanks for sending your question and congrats on getting Ruby and Marley. I can completely relate to having a spoiled mini pig; it’s really hard to not spoil them! I will be completely up front that I may not be the most help for your situation since I only have one mini pig, but the way Ruby is responding to Marley sounds like how my dog, Rylee, behaves around Oscar. I know there are obvious differences since Rylee isn’t a mini pig, but I can tell you how I’ve been handling my two and see if any of those tips help you. Like Ruby, I completely spoiled Rylee and she has never been fond of Oscar. Oscar really likes her though and follows her around despite Rylee’s snaps and nipping at him. I have been actively working on helping them get along, and we are making some very slow progress. You might already be doing this, but let them work it out between them as much as possible while keeping a close eye on them to make sure things don’t get out of hand. It’s not uncommon for piglets to nip at each other until they have figured out the hierarchy, so they might do that for a while until it’s settled. For us, Oscar follows Rylee around, she snaps at him a bit, he backs off, and then tries again a little later (mini pigs are persistent!). I watch them very closely but try not to intervene unless it’s getting dangerous. A second thing I’ve been trying is petting them both at the same time or cuddling with both together. I want them to see that I can love both of them at the same time, so if they will get close enough to each other for me to interact with them both together, I take advantage of that. Also, I’ve had some luck with them getting closer to each other in the sun spot since they both love the warmth (you might try a warm blanket or bed if Ruby and Marley don’t like the sun spot yet…it took Oscar a while to “find it”). When they can both nap in the sun spot, they seem to let their guards down a bit and appear to be building some trust slowly. The part that concerns me is Ruby’s biting. Since Rylee isn’t biting Oscar or us, my tips above may not be aggressive enough. In that case, here is an article on introducing a second pig that might be useful (http://www.pigs4ever.com/pot_belly_pig_information/pot_belly_pig_behavior.php). Also, here is my go-to article on biting in case Ruby continues to bite you or Marley (http://petpigs.com/resources/pig-training/whos-the-boss-i). Since both Ruby and Marley are young, I’m optimistic that they will be able to adjust and at least get along. It’s also promising that Marley isn’t fighting back, so maybe Ruby will realize she is the top pig soon and settle in with him. It’s disappointing bringing home a friend for your pet and then having them not like the new friend, so I hope things get better for them. So far, all of my pets have just tolerated each other (at best), and it’s hard when you just want them to enjoy each other’s company and they don’t. Please keep me updated and let me know if things improve and, if so, what worked. Sorry I couldn’t give you a quick and definitive answer, but hopefully some of the information will help! I recently got a orphan piglet he is two weeks old. She doesn’t like my husband. We recently went out out town and Maggie went with us. Before the trip she would love on my husband and go Right to him. On the trip my husbanf didn’t have much to do with her. Now that we are home its like she hates my husband. She doesn’t want him to touch her. What do I do? Hi CJ! Congrats on your new piglet. I don’t have direct experience with a piglet that young and I know that they have special needs at that age, so I recommend keeping in touch with a vet to make sure Maggie is getting everything she needs at just two weeks old. You’re probably already doing that, but I wanted to mention it just in case. If I were in your shoes, I would likely not worry too much about her behavior with your husband at this point and just focus on keeping her healthy and getting her comfortable at home. I’m not sure why she’s acting differently toward your husband after the trip, but you might try going back to basic socialization and have your husband sit on the floor with her and just spend time near her. That will allow Maggie to get comfortable being near him. If she doesn’t want to approach him, don’t force it and instead let her work on her own timing. I’m not sure what she is eating at this point, but when she’s ready for treats, your husband can start trying to give her treats while he’s sitting on the floor with her to help encourage the bond (have him put his hand flat on the floor with palm up when giving treats so that she learns to take food gently). I’m definitely not an expert on a piglet that young, but I would just focus on her health and comfort for now and add in a little time with your husband sitting in the same room with her. Hope that helps! I had no idea that it was natural for mini pigs to foam at the mouth when they’re hungry. My own mini-pig just started doing this and it’s been really worrying me. Thank you for letting me know that I have nothing to worry about! If you have any more tips, please share them. I have a new mini pig named Dewy. We have had him for about 3 weeks now. Potty training is a hit and miss with him. (We use a litter box) Sometimes he will go in his box and sometimes he goes on the floor. I’ve also noticed that when we keep him to his confined area, he poops everywhere! (like he is mad) I want him to have more range of the house but i dont want him to have that kind of space till he is better with the potty training. Do you have any tricks on potty training..he is about 14 weeks old now. Thanks! Hi Lindsey! Congrats on getting Dewy! Unfortunately, this is not my strongest area since I don’t have any direct experience with litter box training. Oscar has always gone outside to potty. One thing others have recommended is to put a piece of the poop in his litter box to make sure he doesn’t have any confusion about where to go. However, in this case, it sounds like he’s acting out by pooping. I absolutely agree with you about not giving him extra space until his potty training is better. You probably already know this, but make sure his eating and sleeping areas aren’t too close to his potty area since they don’t like to mix those two spaces. Otherwise, if it’s a behavior thing, try making sure he’s getting plenty of stimulation and play so that he’s tired and satisfied. There are treat balls and other toys that can help keep him entertained and busy. Not sure if that will help, but it’s what I would try next to help the behavior issues. Especially in winter, keeping pigs stimulated and happy can be tough without outdoor rooting time. Sorry I don’t have direct experience to help with your question, but hopefully something in there helps with Dewy! Another thing I was wondering was if girls are the more aggressive ones? And if they are of there’s any way to make them less aggressive? What are some things I can use for litter? So I just got my mini pig Harley today! He is 6 months old. And he just wants to sleep right now. Is that a problem? Or is it because he needs to get used to being in a new environment with new people? I really just want to know if it’s anything to worry about. Hi! Here is a great resource on mini pig nutrition with some feeding guidelines I think you’ll find helpful: http://americanminipigassociation.com/mini-pig-education/mini-pig-nutrition/. Each pig is different of course, but when Oscar was about 20 pounds, we fed him 1 cup pellets daily (1/2 cup twice a day) along with some veggies for snacks. Oh my! I will say this site has been so helpful! i was tirelessly searching for good information, but i could not find a darn thing that was positive! I pick up my 6 month old unnamed mini pig on Saturday and i will say i am a little nervous! Keep up the great posts! Thank you! I’m so glad the site has been helpful! I try to keep it positive but honest. 🙂 I was a nervous wreck the week before and especially the day we picked up Oscar for the first time, so I completely understand. It’s such an exciting time though! Good luck picking up your piggy on Saturday! Hi! I got my pig about a month ago. Her name is Amelia 🙂 She is almost 12 weeks old. When I got her we found out she had mange so we got her treated but now she has a lot of dandruff so was wondering if you use lotion on Oscar ad if so what kind do you use because I want her skin to be healthy. Hi, I was just wondering why you make a mold and freeze the coconut oil if it gets broken up into Oscar`s food . Why not just measure out the appropriate amount and put it directly on his pellets ? I love your blog. Your piglet is so darling. Hi! We have a piglet that is almost two months old and we have had him for 3 weeks now. He is very cute and mostly easy going. However, he is still hesitant about us petting him and squeals when we pick him up very loudly and for a very long time. He does better when wrapped up in a blanket. There were brief moments when he was better with being picked up, but every day it feels like we’re starting from scratch. It feels like he’s a bit high strung in this area. He sleeps in a crate and unfortunately we are gone every day until about 4 o’clock. We will have much more time with him soon though during summertime. I wish he would feel more comfortable and easier about us holding him. It seems some people sleep with their piggies. Is that what it takes to bond with them? I have tried doing what you suggest and have held him through the squealing. One time it worked, but a few days later he managed to wiggle his body out of my hands and just wouldn’t stop squealing and trying to get away. Hello there! I’ve been reading the blog and you seem to know a lot about many pics. Thank you for the information that you provide. I would like to know if I could ask you a question? I’ve had my mini pig for one year. He is about 30 pounds and is lovable and sweet as ever. My husband built him a very large kennel about the length of a room we put his litter pan at one end and his bedding and blankets at the other end. This is where he sleeps at night. And while I’m at work during the day. Other than that he roams the house or plays outside. Everything has been just fine he potties outside and peas in his box inside the kennel… When he is home alone. However, three days ago I noticed that his letter was not wet. I thought he had matured and was just holding it for longer. I was very happy! I have always wanted him to hold it during the day and go outside like my dogs do. But I’ve never had that kind of luck with him. Anyway, I started noticing the smell and decided to wash his bedding. That’s what the problem was… He was Pinot all over his bed. He was no longer using his litter pan! I am at a loss!!! I have no idea why he would do that?! The floor of the kennel is wood… So I can’t get the smell out and he won’t stop peeing there!! It’s like his litter pan is not even there! Ugh! I’m not sure what to do? Any thoughts? We are concerned about our 5 wk old baby pig. He has a great personality and seems to be adjusting okay since we brought him to our home of 6 children, my husband and myself late last night. We had a five hour drive to go and pick him up so I think it could have something to do with his reactions. I’m worried about him though. He is very shakey and just seems gloomy. I believe it is because he just left his mom and other piglets but, I needed more extensive advice to help calm our children along with myself!! As you can imagine our kids are extatic about our new family pet! Thank you soo much for your help. Your blog has helped us already so much!! Hi Tiffani! Congrats on bringing home your baby pig! I’m sure he’s still adjusting, and it might take quite a while before he’s really adjusted and comfortable at home. Mini pigs just take a while to warm up and adjust, especially when they’re so young, so it’s totally normal for him to take some time to calm down. I recommend gating him in a small room with his litter box (if you’re using one) and his bed, and letting that small room be his space. He will want a space of his own while he adjusts. Then, I would have one person at a time go in the room and just sit with him. If he’s comfortable being touched, that’s awesome. If not, don’t rush it and just sit in the same room and talk to him until he gets more comfortable around each person and starts approaching on his own. If you want, you can offer him little treats (put your hand flat on the floor with your palm up and put the treat in your palm so that he learns to take treats gently instead of snapping for them) to see if he’ll take those and warm up more quickly. The beginning can be a little frustrating while they warm up, but I’ve found just giving them their own space and letting them adjust at their own pace works best. Hope that helps! The beginning can be both a fun and frustrating time, but hopefully he’ll start warming up soon. Hope that helps! Hi there! I have been doing ridiculous amounts of research to see if getting a mini piggy is the right fit for us. My challenge is that I am a teacher and work a lot. My boss (principal) approved that I could bring my pig to school with me so he/she gets stimulation throughout the day. My class is very good with animals–we used to have a bunny that would roam freely around the classroom during the day. I was curious about your opinion on this topic. I found another teacher in Jacksonville, FL who brings her two mini pigs to work as class pets and she only raves about it being a success. I understand there will be challenges but you have such a great knowledge base about mini pigs that I would love your opinion. Lastly, do you mind me asking which breeder you used? Hi Katie! That’s awesome that your principal approved you bringing a pig to school because I can see that being fun for you, the kids, and the pig. I have also seen this work out well in some cases, and that certainly seems to be the case for Prissy and Pop. My biggest concern is that a lot of mini pigs have biting issues. Oscar is one of those pigs, and I know we’re not alone because I get tons of questions about biting mini pigs. In Oscar’s case, we’ve been able to decrease his biting issues but not solve them. He tries to bite the most when we move him after a nap and when we touch the right side of his face (not exactly sure why that spot is an issue for him). So, while his biting is often at predictable times, I’m not sure I would be comfortable with him in a classroom of children. The other issue is that some mini pigs have aggression issues which can result in charging people. We’ve been lucky so far and haven’t had this issue with Oscar, but my understanding is that it happens mostly with guests to your home and children. What happens is that the pigs are picking the lowest “ranking” person to challenge for hierarchy, and that usually is children since they are smaller, typically more fearful, and will back down the easiest. I read about this happening the most in a home environment where pigs are challenging others in their family, so it’s possible it wouldn’t be an issue in a classroom at the school, but I wanted to mention it just in case. Basically, where I land is to make sure you’re prepared either way, whether taking your pig to school would work out or not. If getting a pig would still work for you, despite you working a lot, then it’s just icing on the cake if your pig handles going to school well. I do think it would help if your pig is going to school and is around the kids from a young age. However, if you wouldn’t be able to keep the pig if him or her going to school didn’t work out, then I would probably consider waiting until you are working fewer hours or have a good arrangement for your pig during the day that you feel comfortable with. It would be heartbreaking for you to get your pig, fall in love, and then have it not work out. I see it as kind of a “hope for the best; plan for the worst” situation. There’s a lot to think about with your decision, but hopefully that gives you some things to consider as you make your decision. Hi Marco! It’s possible that’s normal, but I haven’t noticed any hard lumps under Oscar’s armpit before so I’m not sure. If it were me, I would take him in for a check by the veterinarian just in case to see if it’s normal or something more concerning. Hope everything turns out okay! Thank you so much an Also one more question they dnt sell the mazuri mini pig feed here what else can I give him to eat ? There are alternate types of mini pig food and other natural diets that they can eat. The natural diets can be healthy for them, but they are quite a bit of work to keep it all balanced. For the mini pig food, you might try a feed store if you can find one and if you haven’t tried that already. We buy ours from a local feed store. Another option might be ordering the food online and having it shipped or asking your vet to see if he or she can order it. If you still can’t find it, you can look into natural diets. There is some helpful information online about natural diets and it’s all food you can find at a grocery store, but it can be quite a bit of work to make sure your pig is getting all the necessary nutrients. Hope that helps! I love this blog! It is not only adorable, but I think it helps to inform people about mini pigs, especially those that insist they “don’t exist.” Right… My mini pig’s name is Hamlet. He will be 1 in July. I was wondering if you have any tips or tricks you use to bathe Oscar? I am having a tough time. Hamlet panics and goes potty every time (sorry for TMI). I have tried a large sink, shower, and baby pool to no avail. Hi Alexis! Thanks for the compliment on the blog! You’re not alone in having a pig that potties in water. We’ve been really lucky in that Oscar hasn’t tried that yet, but I’ve heard from a lot of other pig parents that it’s an issue. It happens a lot in pools during the summer. Unfortunately, it may be a habit you have trouble breaking. As for bathing, we put Oscar in the tub with one of those rubber mats on the base of the tub to keep him from slipping. My husband feeds Oscar peanut butter from a spoon while I bathe Oscar very quickly. You might try keeping Hamlet really busy during his bath by distracting him with food, like peanut butter or Cheerios. We feed it to him directly during his bath, but I know a lot of people have luck putting the treats in the bath water and letting their pigs hunt for the treats. I wonder if putting treats in the water will keep Hamlet from pottying while he’s in there? Might be worth a shot! Sorry I don’t have a great answer for you but, if I hear of something that works for that, I be sure to share it! Hi i m having the same kind of problem vut only when i leave im with a nanny. Coult he miss us so much he becomes really bad? When he was with the nanny for the week end(at our home) he never used his potty even once dit all he had to do everywhere. Once we got back home everything was alright. But if we leave him alone at home even for a shortbperiod of time he s gonna have left us absuprise on the floor. What can i do?? Hi. I have two mini pigs, which I got about three weeks ago. I trained them to use the litter box and just recently I started taking them out to play on our yard. I noticed that they are no longer pooping ( sorry for saying like that) inside their litter box but instead just poop outside, which is great but I don’t want them holding it in also. I feel bad. Also, they’re about 10 weeks old, so I’m not sure how much I should feed them. The people who sold them to us, told us we would feed them 1/2 a cup of pig food twice a day but I feel extremely awful to let them starve like that and I’m not home all day so I also try to leave them some water but I’m sure they drink within an hour or so and I just don’t know if they can be without water for so long. I’m just so worried about them. I don’t want them feeling miserable. Any feedback would be much appreciated, thank you! Hi Cindy! I wonder if there’s a way to have someone check on them during the day to take them out and refill their water bowl while they are still so young? I can understand why you’re concerned about them holding it in and also about their water consumption during the day. Hopefully, if they really need to go at some point, they will decide to use the litter box since they have it there as an option. I would be more concerned about the water since getting enough water is always a concern with mini pigs. A lot of times they will drink it right away, like you mentioned, or some will even tip their water bowls over and spill it and end up not getting enough to drink. I wonder if any other pig parents who are out of the house during the day have come up with a good solution for handling the water issue? If so, maybe we’ll luck out and hear from someone with a creative idea to help with spreading the water out during the day. As for the food, here is the web page I always recommend for food amounts. http://americanminipigassociation.com/healthy-pellet-diet/. The amounts on there are consistent with what I feed Oscar, and I think it’s a good approach to feeding. So, definitely check that out to see how much it recommends feeding your pigs (it goes by their weight), and hopefully that will help you feel more comfortable with how much they are getting each day. For what it’s worth, it sounds like your two pigs have a concerned, loving mom! Hi! I got my baby boy, Ziggy last month. He’s currently 7 weeks old, he was neutered prior to my picking him up. He’s adjusting well to my household for the most part. I keep him, litter box, bed/blankets, food and toys in a wire pen in my living room..He’s been allowed to roam around the living room for a little while in the past, but only for short amounts at a time so he can get used to it. Anyway, my main concern is he’s been having accidents inside of his pen right next to his litter. The breeder worked well with him on litter training before he came to me and since the first day i brought him home, he pretty much had the hang of it…He’s been successfully using his litterbox since he came home, but now these past few days it seems he’s forgotten what his litter box is, or he pees right next to it. He even pees at the same time as he’s eating/drinking and he pees on his blankets..Any idea what this is from or how to correct his behavior?? Hi Paige! It sounds like things are going well with Ziggy so far! Unfortunately, I’m not the best resource on litter box training since Oscar only goes outside. However, I can give you a few thoughts and see if any of those help. Your question is one that I get pretty frequently, so it’s a somewhat common issue with piglets fairly new to home. One thing to check is that his bed and litter box are a good enough distance apart. Pigs don’t like them too close together, so that can cause problems with litter box training. Another thing is if he can climb into his litter box easily. If he really needs to go and is feeling lazy, he might go next to it instead of stepping in. My last thought is if he’s getting too much water while he eats his meals and then just can’t hold it. We used to give Oscar his pellets along with a full bowl of water, and he drank so much during his meals (going back and forth between his pellets and water) that he would pee several times within the next hour and he had a lot of accidents that way. I should mention that it’s recommended that mini pigs have access to water at all times, so this advice isn’t popular but is what worked for us. Instead of giving him water during his meals, we added some water to his pellets to wet them down and then gave him his water bowl immediately after he finished his meal. It’s important that Ziggy have some water (which is why wetting the pellets works) so that you reduce the risk of the pellets causing a blockage and of course it’s important to always make sure he gets enough water overall, but handling his food and water that way during meals allowed Oscar to still get enough water overall but reduce his post-meal accidents. Your idea of wetting down pellets and giving water after meals is one I will have to try! His potty box and bed are on complete opposite sides of his pen so I would assume that’s far enough? Not sure though, I may have to get a bigger pen! I had one idea of why he’s regressed with his trainin.. He has had a few accidents in the house that weren’t properly handled. Meaning ziggy didn’t get properly “punished” for it which is just simply me telling him bad piggy and putting him in time out for a little bi.. Maybe that led him to believe he could potty anywhere? He is pretty young yet so I’m trying to have as much patience as possible, just hoping he snaps out of it lo!!! Please help I have a Piggie boy and he has strange hard flat lumps over his shoulders they feel like a plate of metal under his skin. They are flat. You can’t bunch the skin up where they are the skin is hard. Hi Edweena! I would recommend taking your little guy to the vet to have his lumps checked out. It might not be anything, but it’s not something that I’m familiar with on Oscar. At least if it’s nothing, you can have some peace of mind. Hi, my name is Jordana. I have 5 month old girl teacup pig named Chandler. She’s such a sweet heart but there’s something I’m curious about. She seems to get kind of anxious and antsy when she’s inside. She’s fine when she’s playing with toys but often even when she’s just walking around she oinks really loudly and screams kinda like when she’s being picked up even when no one is touching her. I was hoping you can give me some insight as to why she does this and if there’s anything I can do to prevent it! I was wondering what we are supposed to do with our piggy if we go away on vacation. He is almost 1 yr old and we are thinking about going away, which we haven’t done with him in the past. Any suggestions as to whether we find a place to board him or have someone check in on him a few times throughout the day? Hi Tina! This is a really tough one. We haven’t left town without Oscar because I’m too afraid to leave him to be honest. One option is to have a family member, friend, or someone experienced with mini pigs stay with your pig or let your pig stay with them. The positive here is that your pig would be with someone the whole time and you could spend some time educating that person on the important things to know, like don’t feed or leave sitting out salty foods, etc. Boarding is also an option, but again this requires a place that’s experienced with pigs and will be extremely cautious to keep your pig away from dogs. This is a long shot but, if you know any other pig owners, a great option would be to set up a situation where you can each watch each other’s pigs when you are out of town. At least in that situation, you’re dealing with someone who already lives with a pig and knows how to handle each situation. This is tough though and is why we haven’t left Oscar yet. The biggest suggestion I have is to focus on someone or some place either experienced with pigs or who is willing to learn about them and get educated on pigs before you leave. Hope that helps! I just got my Hamton at 5 weeks old, I am absolutely in love ! My question is he is starting to swipe and snap whenever if I go anywhere near his mouth, and absolutely seems to still be afraid and runs away from my family and I, we have only had him a few days and I know it takes time, but the other piggies I have never did have a problem with swiping and biting… I want to do what’s best for Hamton but don’t know what to do. Hi Christina! What you’re going through with Hamton is fairly common, unfortunately, and those are behaviors that we dealt with from Oscar for a long time too. Normally I would recommend Move the Pig (MTP) with swiping and biting, but that’s tricky when your pig is new to home and I would recommend saving MTP for when your pig is more comfortable and adjusted so that you don’t scare him. Although I can’t say for sure, I think some of the swiping and biting you’re experiencing right now will improve as Hamton gets more comfortable and settled in at home. My guess is that he’s just scared right now and reacting in the only way he knows how, and hopefully that will stop or improve as he adjusts to home and to his new family. I especially think that might be the case since he’s so scared still. A lot of the behaviors when a pig is new to home seems to depend on how well the pig was socialized by the breeder (that’s my theory at least), and Oscar behaved very similarly to how Hamton is behaving now. You might already be doing this but, for now, I recommend gating Hamton in a small room (like a bathroom or somewhere similar) and just having one person go in at a time and sit near him. It’s possible Hamton doesn’t want to be touched yet, and that’s okay if that’s the case. If so, don’t rush it and instead let him approach at his pace. One thing that might be helpful is putting your hand on the floor with a treat in it (back of hand flat on the floor with palm up so that he doesn’t learn to snap for the food) and let him approach if he wants. I think that he will come around with time and, as he sees that no one is a threat to him, hopefully his swiping and biting will stop. You mentioned having other piggies so sorry if you’ve tried this already, but hopefully some of that helps! Hi we just bought our first micro and I am curious about giving them water. Should they have access all day long? It seems when I do give Peggy (she’s 8 weeks) the water bowl she takes a drink and dumps it after. I worry when she’s in her cage while I’m at work she will dump it and be without all day. Any ideas for me? Thank you. Hi Janelle! I’m home with Oscar during the day, so I’m not going to be the best resource for answering how we handle this. However, my understanding is that it’s important for them to have access to water all day long, so I would recommend that for Peggy. You’re not alone in the challenge though because it’s fairly common for them to drink a little and then tip their bowl. One thing I have seen recommended is to get the little bowls that attach to the side of a crate so that they can’t be knocked over or to see if you can find one that won’t spill (which Peggy might just see as a challenge…haha). We’ve had a lot of luck with the little bowls we got from Target when Oscar was little. We took the little rubber edging off on the bottom, and he seems to have trouble spilling this type of bowl…it slides around instead of tipping. Not sure if it will work for Peggy or not since some pigs are just determined to tip their bowls, but it might be worth looking into. I’ll put the link for that bowl below. I know other pig parents have had this same challenge, so maybe someone else will also respond with how they handle this issue. Hope that helps! Hi I did a lot of research on mini pigs before I got my first a few days ago. His name is ralphy. Everyone I talk to seems to say the same thing that its not the best thing for my pig to only have him. Pigs need to communicate with other pigs or they’ll get depressed. So now I’m worried that I’ve made a huge mistake because ultimately I want ralphy to have a long happy life. Do you think I should consider giving him back to the breeder because I know I don’t want a second pig. Hi Caitlin! There are differing opinions on this. We only have Oscar, and I’m happy with that decision. When/if the time becomes right, I’m not opposed to getting a second pig because I do think that might make him happier. However, if we only end up with Oscar and don’t get a second pig, I think he can still have a happy life. Personally, I think it’s more important that Ralphy get enough love and attention rather than it being specifically from another pig. With Oscar, we spend tons of time with him and make sure he’s getting the time and attention from us that he needs. Now, some people will definitely disagree with me, but I personally don’t think we’re giving Oscar a bad life by only having one pig. It’s something you will want to decide for yourself but, if you’re committed to Ralphy and can give him the attention and love he needs, I personally don’t think you need to give him back to the breeder just because you don’t want a second pig. Just my opinion! Hope that helps! Why does my mini sometime open her mouth as if clearing her throat. I don’t know how to explain it, like she is smelling and gagging-no noise tho. Hi Faith! In my experience, potty training pigs is typically easy in the sense that they often learn where they’re supposed to go quickly (whether it’s outside or in a litter box), but it’s a little more challenging getting it perfected without accidents. So, hopefully that makes you feel a little better! We ended up not litter box training Oscar, but your question is one I get quite a bit so you’re not alone. I’m guessing you’ve tried all of these things by now, but make sure the litter box is easy for him to get into, is big enough, and isn’t slick on his hooves or anything like that which could deter him from wanting to get into the box. Also, if you’re using potty pads, you could try pine shavings, or vice versa, to see if that helps. Also, if you can pick him up and put him in it, try doing that to make sure he knows to go in there. I guess the next thing I would try is to see if it’s possible to put the litter box in a corner or an area where he can’t move it around or get next to it to pee. Since I don’t have as much experience in this area, I’ll link to an article below that is the most helpful I’ve found on litter box training. Sorry I don’t have a great answer for you, but hopefully something in the article will help. I just got a 9 month old micro pig and she just doesn’t ever want to socialize. And when she is sleeping she will randomly wake up every 5-10 minutes and start freaking out and sounds like she dry heaves? Is there something wrong what should I do about both situations? Thanks for the help! Hi Katie! On the socialization, it sounds to me like she just needs more time to adjust. Since she’s 9 months old but new to your home, she will likely need a while to get comfortable around you and to start trusting you. In my experience, pigs don’t adjust well to new situations, so give her some time and let her get used to home. Just sit with her or near her and let her adjust in her time, being careful not to rush her. She will get there. I’ll link to a post below on bonding with your mini pig that might be helpful. For the sleeping issue, I’m not sure. It’s possible that’s part of the adjustment, but keep an eye on it and take her to the vet if you’re concerned. You might look up air tasting and see if that’s what her dry heaves are. Pigs “air taste” often when they smell or taste something new, so I’m not sure if that’s what she’s doing but might help explain it. Hope she’s doing well and getting comfortable at home! We’ve had our new mini pig for about three days now we take him outside but he doesn’t go potty when we put them in the litter box he has went one time in the box but it was only urine but he keeps going number two in his bed what Do I do about this? We have 2 mini pigs, Freckles and Mr. Popps. Freckles is a smaller female around 4 years old and Mr. Popps is a lot bigger and he is 2.5 years old. They were getting along very well until recently. They are both neutered and spade. We have a baby due any day now. Could that be the reason. I also noticed Mr Popps making weird movements like a male dog does when it’s aroused. Can a neutered 2 year old male be going thru puberty? Hi Jeff! Unfortunately, I’m not sure on the answers because I just haven’t gone through this yet. There is a group on Facebook called “Mini Pig Education” and I think you would get a much better answer from someone on there. There are some awesome, experienced pig owners in that group, and I’m guessing someone on there has been through this and can help. Sorry to not have a better answer for you! Hi Jose! Since you’re wanting Bentley to be an indoor pig, I would recommend setting him up a small room inside and letting that be his own space while he adjusts to home. It’s normal for them to be skittish and scared at first, and it will just take time being around you for him to warm up. Regardless of which space he’s in, go and just sit with him in the beginning and let him approach you. Be careful to not force the bond; he will eventually see that it’s safe to be around you and will start approaching. If you want, you can take some small treats, like Cheerios or little pieces of veggies or fruit and offer those to him to see if he’ll take them from your hand. If not, that’s ok…just give him time. Hope that helps! I have a pig that needs a home done know where to take her, I really wanted her and breaks my heart to give her away but i just don’t have the time for her. Where can I take her? Hi Maria! I’m sorry to hear you have to give your pig away. I know that would be a hard decision to make. I don’t know of any specific places, although there are some rescues around the US I know of, particularly in Texas, Colorado, and Pennsylvania. If it were me, I would start with a group on Facebook called “Pre Loved Pigs.” It’s a site specifically for rehoming pigs, and people on there can also help by telling you if there are any rescues or foster groups in your area. But he doesnt eat anything and doesnt drink much water is that normall … is he just a bit scared or misiing his mom and sublings ???? And also im not working this month so im with him always but what if i start working next year then i wont be with him as much will he feel lonely ???? Or will our bond go away ???? Hi Nicole! In general, many people say that a pig that won’t eat is a sick pig, so that’s normally a red flag. BUT, it’s not super uncommon for pigs to be hesitant to eat when they first arrive at home. It’s something I would watch closely and you can definitely take him to the vet if you want to be on the safe side, but there are other pig parents who have had the same issue. Water is something to watch as well because pigs need a good amount of water to stay healthy. I would keep offering him food and water and even some treats to see if he’ll take anything and see if you can get him to eat. Hello! I have had my sweetheart Opal for about 4 months now, she’s 6 months old. This morning I found it odd that I didn’t hear her up and moving in her room as I was getting ready. She’s usually up and ready for breakfast as soon as she hears someone else up. As I walked into her room she was still in bed. So I proceeded to give her her daily breakfast of mixed oats and sweet feed. She nibbled at it for a while but soon lost interest and went back to bed. When I enetered her room again I decided if I should give her anything else to eat in attempts to see if she would have a bite at that. She ate cheerios and grapes. But still would not eat her breakfast bowl.. I’m not sure what to do or if you’ve experienced this problem before with Oscar. If you have any suggest as to what may be wrong please help! Also i am not sure if it’s as serious as to call the vet or not, as I am a new pig owner and don’t have much experience with behavioral problems or possibly sickness. Hi Sarah! Typically, when a pig isn’t eating, it means the pig is sick. It’s not that there aren’t other reasons or that I want you to panic, but that’s the saying. We had Oscar get sick from some medicine he was taking once, but otherwise he’s always eaten his food. One thing you can do at home is take your Opal’s temperature. If she has a fever, then I would definitely recommend taking her to the vet. Honestly, even if she doesn’t but is still not eating, I would probably take her just in case. In the event of something like pneumonia, early treatment can make all the difference. If you do take her temperature, one important thing to know is that a pig’s body temperature is normally warmer than a human’s. I’m not at all an expert on how to handle this situation, but Mini Pig Info has an excellent article on how to take your pig’s temperature, what temperatures are normal and which aren’t, etc. I’ll link to the article below. Also, I recommend checking out the group “Mini Pig Education” on Facebook because there are tons of experienced pig owners on there, and someone might have a better answer for you. I hope Opal is feeling better soon! Hi I just wanted to say I just got my mini pig a few days ago. “Harley Quinn” is a 6 week old kune kune /Vietnamese potbelly cross and she stays indoors with us of course. But she literally wants to be held all the time. She will get down and post for a bit, but rest of the time she wants to be snuggles and held and has been like that since the first day I her. She is like an overly attached child. She even loves my 1&2 year olds. She is just perfect for our house and is so adorable with her little spots but I just wondering if you heard of a pig acting like her with wanting to be held constantly. Hi! We just welcomed 2 month old Henrietta (a juliana pig) to our family this past weekend. She is our first and only pet as of right now, we put together & baby proofed a nice size room for her to roam and hang out in when we go to work. We’ve made little stations in the room for her bed, play area, food/water & bathroom. I have started to turn on the radio and give her a snack right before I leave for work. But it makes me very sad/nervous when I leave because she is lonely. We eventually plan on getting another pet (most likely a dog) in the near future but was wondering if you had any suggestions on what I can add to her room in the mean time to keep her a little more occupied for the 4 hours I am gone during the day. Hi! I just recently got a mini pig, and her breeders were feeding her “big pig” cheap food, and so she won’t eat the mini pig food I bought. I know it’s very important to feed them the correct food, and I know she’s hungry, can pigs starve themselves to death, or will she eventually get hungry enough to eat it? Help! I’ve heard of people mixing 100% pumpkin puree in with the food – pigs love pumpkin. Just make sure there’s no sugar/salt/additives in it. You can slowly reduce the amount of pumpkin until it’s all food. Or mix the new feed in with the old feed. When we first brought Peter Porker home, he was reluctant to eat, so we made a mush for him out of food, formula and grated carrots for a few weeks. Once he became more comfortable, he started eating regularly. He’s just over a year now and eats almost anything. Cucumbers are about all he won’t eat at this point! Hello I am interested in getting a pig but I am not sure what to do if I am at work or school? So now I am unsure if it’s the right time. I have a pig, I have had her for 2 1/2 years, but ever since she was little she has only chewed on my grandma’s clothes, why is that? I’m trying to travel for a year or maybe more! Problem is that I have 2 adorable (and amazing) pigs that I’m unsure how to take with me. The information out there is so little I thought I would put my feelers out in a blog and see if anyone has every traveled across state lines but ALSO across country lines. I’m really wanting to travel the world but I’m starting the States first. State to state seems doable as long as I get vet approval and make sure that state is cool. But I’m having a really hard time finding information about taking them to other countries. And worse, I can’t find information about coming BACK into the States after we’ve been gone. Anyone at all have any information?? I was also thinking about a long term pet sitter until I get back…has anyone heard of such a thing?? Hello! My Fiance and I are considering adopting a mini pig! However we both work overnights at a police agency. Since we are working 12 hours shifts I am a bit concerned about leaving the pig alone for that amount of time. Do you have any suggestions that could ease our minds. I am getting a mini pig in a week, I work full time. I have a crate and a penned in area, I want to train Maggie to go outside but when she is alone is it ok to do a litter box or will it confuse her ? Hi I have a 6 month pig and he has started either carrying his pooh to his bed or poohing in his bed( i am still yet to see) first off…is this normal? and secondly…how can i stop it? Can my pet pig miss me so much if i leave that he becomes terrible?? We left for the weekend leaving or pig and dog with a baby sitter at my home and all week end he destroyed everything he could find and never used the potty for the whole week end just did what he had to do every where. I have fallen in love with mini pigs and I know many friends that have them. I have all the right requirements except for a veterinary center that takes pigs near me. The closest places near me are the Jarrettsville Veterinary Center and Chadwell Animal Hospital. I’m not sure if they take care of mini pigs so can someone please get back to me. Thank You so much!